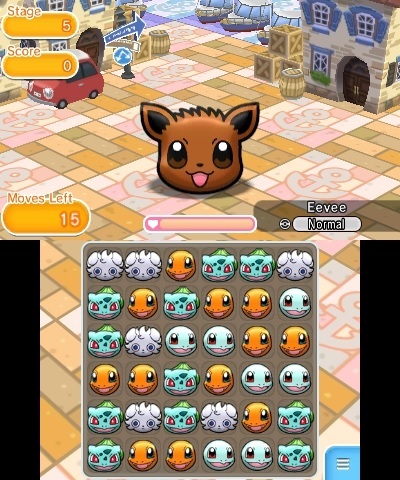 Pokémon Shuffle / PokéToru (ポケとる) is a puzzle sorting game. It was developed by Genius Sonority Inc. for The Pokémon Company. During the January 14th, 2015 Nintendo Direct, Nintendo President Satoru Iwata revealed the Freemium game. The game is similar in style with Pokémon Trozei! 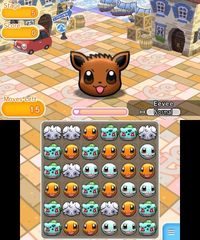 as players are required to line up similar Pokémon to clear them from the playing board. As a Freemium game, players download and play the game for free but there are also options to purchase paid content that help players progress through the game a little easier such as extra play time. There is a limit to how many stages players can go through for free without taking a play restricted break. In Pokémon Shuffle, the players goal is to clear various stages. 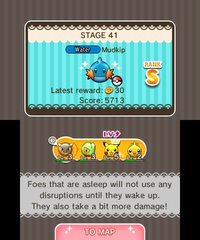 Each puzzle stage, the player can deal damage to the wild Pokémon they face by lining up three of the same Pokémon to clear them. The is a limited number of opportunities in which to move a players Pokémon around but there is no time limit, so the player can take as long as they'd like to study the board. 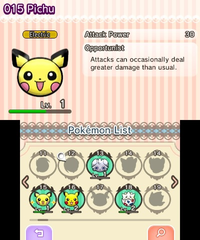 To clear each stage, players have to reduce the HP of the wild Pokémon they face to zero within a set number of moves. 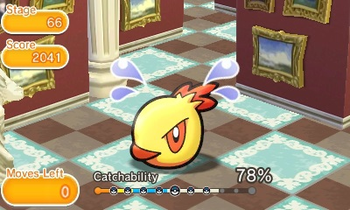 Strategies and tactics are an important part of the game as clearing Pokémon efficiently is the key to winning Pokémon Shuffle's many stages. Pokémon each have their own type which has its own strengths and weaknesses. Choosing a group of Pokémon that is right for each level is important as the player will be able to raise the level of their Pokémon by using them multiple times, enabling them to deal more damage to foes. Collecting many different Pokémon and raising them up so that the player will be able to make their way through the battles against wild Pokémon with finesse is an important aspect of the game. 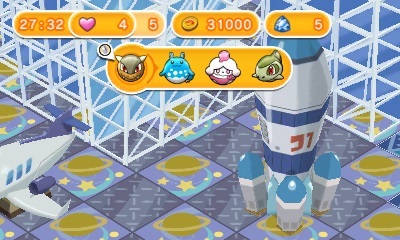 Pokémon Shuffle also features Mega-Evolving Pokémon. When a player Mega Evolves a Pokémon, it can clear out a whole heap of Pokémon at once or cause other special effects. With the new Super Catch Power (Super Get Chance スーパーゲットチャンス) added in update version 1.2.0, Pokémon are easier to catch than before as players get another chance to catch the Pokémon at the end of a stage after failing to catch it. On occasion this feature will trigger and a Pokémon will seem to be panicking which will give the player a huge boost in the Catchability percentage. 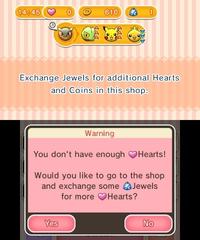 Before the version 1.2.0 patch, players had a stock of Hearts which included both the Hearts that automatically regenerate and those received in exchange for Jewels or for passing by other players. With the update, the Hearts that a player automatically regenerates were stored separately from those received by other methods, allowing regenerating Hearts to always be used first. 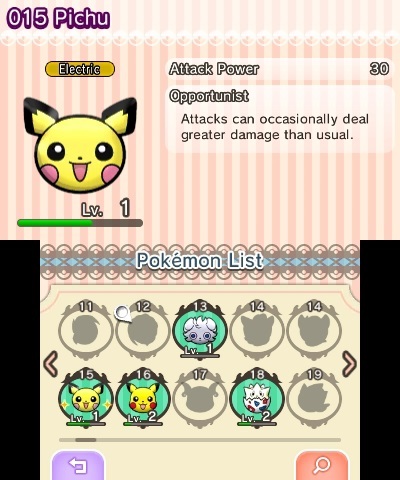 Before the version 1.2.0 patch, it was only possible to check your Pokémon’s current level and skill on the Pokémon List or on the list of Support Pokémon displayed before beginning a stage. The update allowed players to see a Pokémon's level and skill info whenever they caught a new Pokémon. The combo number is displayed on screen for a slightly longer amount of time in update version 1.2.0 allowing players more time to take a picture to post on Miiverse. Free to play game allows anyone with a Nintendo 3DS to play this game. Features Mega-Evolving Pokémon to assist the players through the stages. Collect Pokémon of different types to clear the board. This page has been viewed 15908 times.